This was my actual itinerary in Paris, Normandy and the valley of the Rivers Loire and Cher. I was travelling with my sister and niece who live in Australia. En route I visited Ronelle van Wyk who lived just outside Tours at the time and stayed in two chateaux! 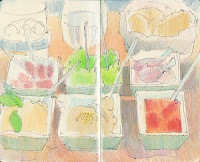 Eating International in Paris (two sketches) - two sketches from a restaurant that isn't serving French food! 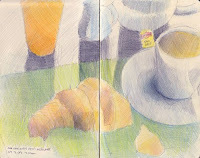 Petit dejeuner @ Dolce e Amaro - I did a sketch every morning in the cafe where I took breakfast. This is the record of an Italian cafe in Paris! 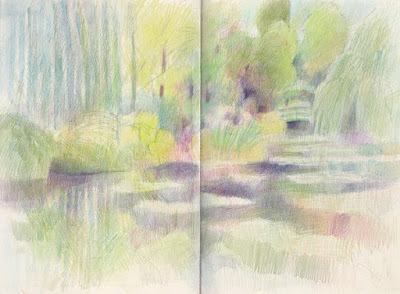 Monet's Waterlilies at the Musée de l'Orangerie Paris. A day in the Musee d'Orsay. 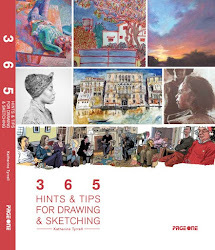 No sketches because this time I actually had a camera which took decent photos but didn't flash indoors which gave me the opportunity to record masses of paintings on my camera - so long as I didn't flash(!) and I spent the whole day here - apart from a quick trip to the Sennelier shop! Dining out in Paris - Montmartre and Saint-Germain-des-Pres - Two sketches from dinners in Montmartre (Tuesday) and the Latin Quarter (Wednesday) plus photos. Wednesday 30th September - Another day spent in a museum. This time it was A Day in the Musée du Louvre followed by a walk through the Jardin du Palais Royal. I've got two sketches of self portraits by Rembrandt two sketches of people taking a break. 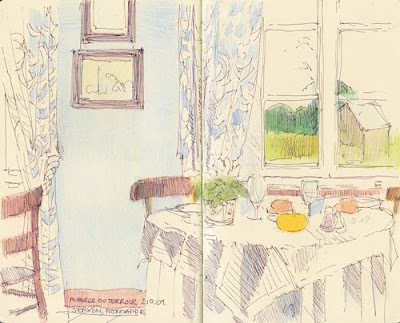 Plus a sketch of the Auberge du Terroir, Servon (near Mont St Michel) where we had the best restaurant meal of the trip. Monday 5th October - a visit to Château d'Azay-le-Rideau (Background: Azay le Rideau). There was no time for sketching as it was raining and we were on a heavy duty day visiting chateaux! Tuesday 6th October - a visit to Chinon (Background: Chinon). and a sketch of people lunching in the sunshine under the trees in the town square in Dejeuner sous l'arbres. Thursday 8th October - This was the big trip to the Château de Chenonceau (Background: Château de Chenonceau). I attempted a sketch of the Château de Chenonceau with its arches over the river - not easy - but was very disappointed that one end was covered in scaffolding. Friday 9th October - Friday morning saw us on the road for the long drive back to Paris with a deadline to meet so my sister and niece could catch their plane. (Background: 9th October - the end of the Grand Tour!) . We dropped off the car at the Gare de nord, my sister and niece headed off to L'aeroport Charles de Gaulle and I took the metro to La Mouette to visit the Musée Marmottan. Two sketches of Monet paintings of the water garden and one sketch while having a quick snack before boarding the Eurostar to come back to London - to be met by "he who must not be bored while I sketch"! I'd just like to record before I get started that I actually finished the trip weighing less than when I went. Which means that Sketchercise very definitely works! 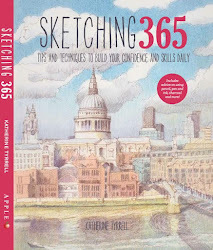 I relaxed the diet just a little bit (odd glass of wine and a bit of cheese now and again) but did lots of walking as well as sketching. 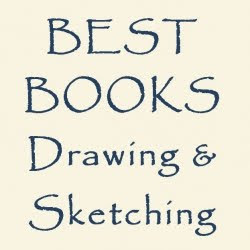 Sketches have been posted to this page as they are published as blog posts. 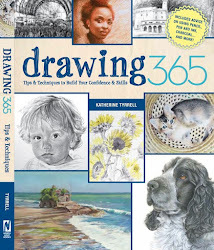 You can also see a gallery of all my sketches in France in Katherine Tyrrell travels with a sketchbook in France on my portfolio website.